Who doesn’t buy extra Halloween candy? I don’t believe you if you don’t…ha-ha. We live in the country now and I will not even get trick-or-treaters this year. That will not stop me from buying hoards of Halloween candy. Especially Reese’s Peanut Butter Cups and Take 5 bars. Somehow it doesn’t seem as sinful when purchasing miniature size bars. Anyway, this is a simple, simple recipe that is perfect for Halloween parties at home or at school. My oldest son loved these (the younger one is allergic to peanuts). They are moist and full of deliciousness. I also think these would look cute with those candy corn pumpkins too. In fact they might be even cuter. If you don’t like candy corn, use an M&M or other type of candy. Lots of possibilities here. Preheat oven to 350o F, with racks in upper and lower thirds. Line two 24-cup mini muffin pans with paper liners. In a medium bowl, whisk together flour, baking powder and salt. In a large bowl, using an electric mixer, beat together peanut butter, butter and brown sugar on high until pale and fluffy, about 3 minutes. Beat in egg and egg yolk, scraping down bowl as needed. With mixer on low, beat in flour mixture, buttermilk and vanilla until combined. 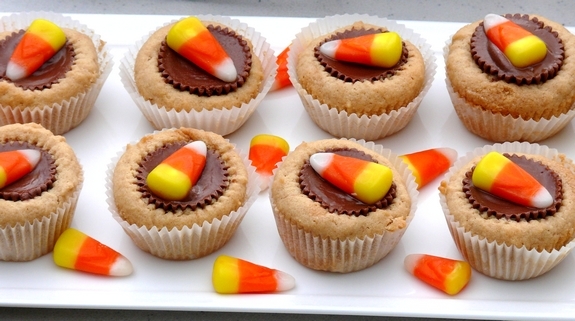 With the large end of a melon baller or a spoon, place 2 teaspoons batter into each muffin cup, then press a peanut-butter candy into each center until batter aligns with top edge of candy. Bake until puffed and set, about 10 minutes, rotating pans halfway through. Oh…how cute! 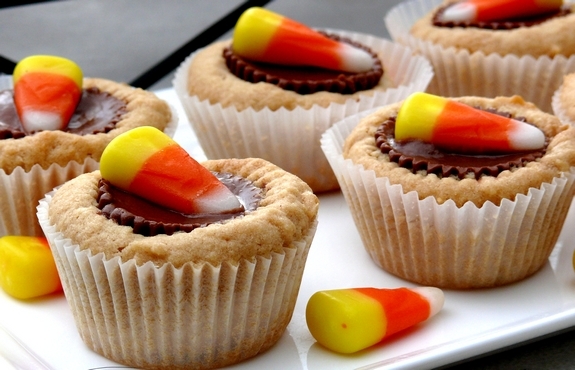 These look like the perfect Halloween treat! Very cute idea. More Halloween treats, please. 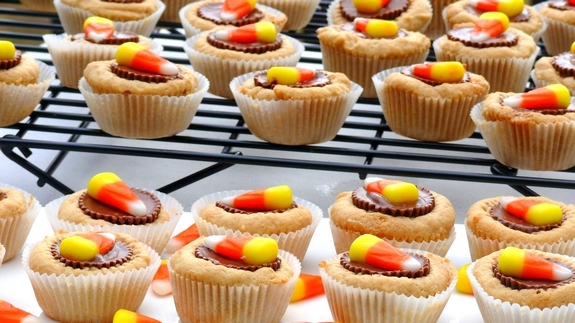 You are the Halloween Queen when it comes to decorating and baking. Those are perfect. I need someone to make them for me. I have never lived in a high altitude area. I would just Google it and I’m sure you’ll find your answer. How do these taste? Is it a good combination of flavors, I might add pretzel instead or along side the candy corn. They taste great and a pretzel is a good idea. I wish I hadn’t seen this! I’m going to gain more weight than normal this fall/winter. haha.